Selling cash-secured puts is a strategy with goals of creating monthly cash flow while retaining capital preservation as a priority. However, many of our astute members are also using this strategy to purchase a stock “at a discount” instead of setting up limit order instructions to the broker. Before highlighting the strategy, let’s review the key definitions. Selling cash-secured puts: Giving the right, but not the obligation, to the option buyer to sell their shares to us at the strike price by the expiration date. In return for undertaking this obligation, we are paid the option premium. Limit order: An order instruction to our broker and placed by our brokerage to buy or sell a specified number of shares at a specific price or better. Length of time can also be specified. In the case of buying a stock, we are agreeing to buy at the limit price or cheaper. I am writing this article on 3/30/15 with 3 weeks remaining on the April option contracts. 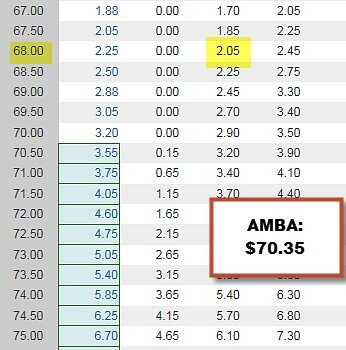 I have selected Ambarella Inc. (NASDAQ: AMBA), a stock on our Premium Stock List as of that date. The price of the stock at the time was $70.35. We will make the assumption that we would like to own the stock but not at that price…$66 would be a great entry point in this hypothetical. A conventional approach to this scenario would be to place a limit order with our broker to buy at $66 or less. The advantage of this limit order is that we are controlling the price point we would enter the position. If the price point is not reached, no trade is executed and we still do not own the shares. The cash would need to be available if the trade was, in fact, executed. If a decision has been made to purchase a particular security at a specific price currently below market value, there is a distinct advantage to selling cash-secured puts over setting limit orders. In the former, we are generating cash flow if the option is not exercised and getting paid while our cash waits to be utilized. If the limit order is not reached, we receive no cash and still do not own the desired security. Should the option expire unexercised, the parameters of that contract can be re-set to another strike price based on current market and corporate information. A possible disadvantage to selling cash-secured puts in lieu of setting limit orders is that shares must be purchased in round lots (100 share increments). If an investor wants to purchase in odd lots, limit orders would be appropriate as “the only game in town”. General members: Click on “Free Resources plus Ellman Calculator” link on the top black bar of this web page. Enter your email address to gain access to download the basic single-column version and its user guide.. Premium members: Login to your premium site and scroll down the “resources/downloads” section to “P” for the single and triple column versions along with the user guide. ***Soon to come: The BCI team is constructing two more amazing tools to enhance our trading skills. The PCP Calculator incorporates both covered call writing and put-selling into one multi-tiered option-selling strategy and the Trade Planner which allows us to manage our trades prior to trade execution, during the contract month and final results. Both will be available within a few months. Initial claims for US unemployment benefits dropped 20,000 to a nine-week low of 268,000 for the week ended 28 March. For the week, the S&P 500 fell by 0.9% for a year to date return of (-) 0.3%, including dividends. BCI: I’m tweaking my current position down to neutral due to pedestrian earnings of late and a slight bias to negative weekly econ0omic reports. As a result, I am favoring in-the-money strikes 2-to-1. An alternative would be to sell out-of-the-money cash-secured puts. This site remains long-term bullish and expects a resurgence of our economy in the second half of the year. I set limit orders whenever I buy a stock…always looking for a bargain! This strategy sounds much better. How do I set this up with my broker? You will need approval to trade cash-secured puts. The level of trading approval can vary from broker-to-broker. Make sure this also includes covered call writing which is usually at a lower level of requirement than cc puts. You will probably be asked to fill out a form stating your financial net worth and trading experience. I’ve attached below an example of levels of trading approval but, as I said, it can vary from broker-to-broker. CLICK ON IMAGE TO ENLARGE & USE BACK ARROW TO RETURN TO BLOG. The Weekly Report for 04/03/15 has been uploaded to the Premium Member website and is available for download. Perhaps I can be a cautionary tale of non-blue collar stupidity. In 2009 I purchased 834 shares of DOG inside a Roth and 203 outside. I “thought” it would always go up when the market went down, but apparently it is for day trading. I want to stop the bleeding, and covered calls sound like the ticket, but can inverse ETF work as well? Any direction would be appreciated. Thanks! I cannot give specific financial advice in this venue but I can make some general statements you should find useful. We’ve all made trades we’ve regretted so if a lesson can be learned it could be money well spent. It is important to identify what is important to us. Is it the underlying security or is it the cash invested in that security…rhetorical question. Since cash is king, we ask ourselves, at this point in time, where is that cash best placed to enhance our returns moving forward. In this security or another? We can’t change the past and should not base our future decisions on past misguided ones. DOG is an inverse ETF based on the DOW 30. To hold onto 1000 shares DOG moving forward would make sense if we were bearish on the DOW 30. DOG is one of the inverse ETFs highlighted in our Premium Member ETF Reports because it is based on a key market index and has adequate trading volume (about half million shares trade per day on average). Writing calls with appropriate strikes will enhance returns and make sense if we are bearish on the DOW 30. If we are neutral to bullish on the DOW 30, another security should be considered. Anyone writing calls on the inverse ETFs in 2008 made a ton of money. Not since. Take a look at a price chart of this security from 2009 through today and convert this experience into a valuable learning incident that will enhance your portfolio returns for years and decades in the future. Rick….I would like to offer my insights on inverse index ETFs. Remember that the underlying for any inverse product, whether “unlevered”, double or triple levered are, derivatives, either futures or options on the referenced ETF. All derivative products experience “time decay” due to the inherent trading costs of creating the derivative. The underlying futures and options are traded monthly (typically). 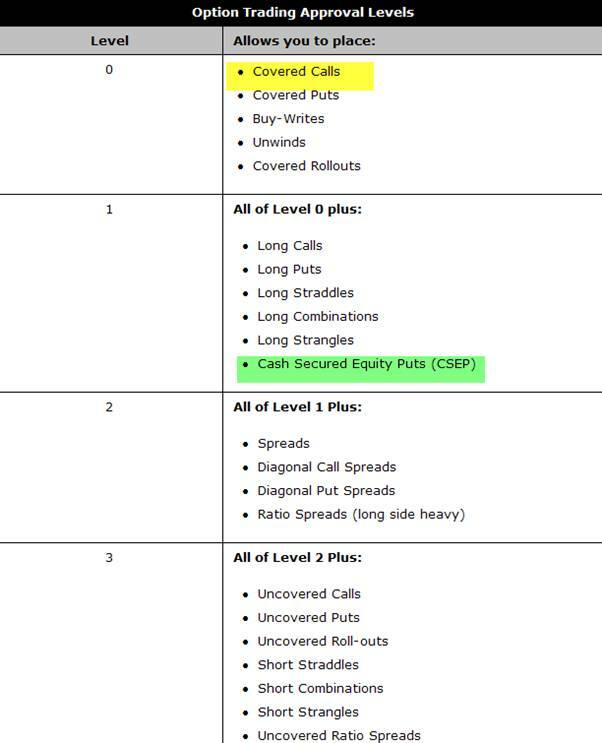 Every trade has a built-in “buy-ask” spread plus commissions. Even institutional investors that create the derivative ETFs will pay these costs, though less than us retail investors. So, holding an inverse ETF will always lose more than the index gains, when the underlying is going up, and will make less than the index when the underlying is declining. As you note, they are best for day traders. 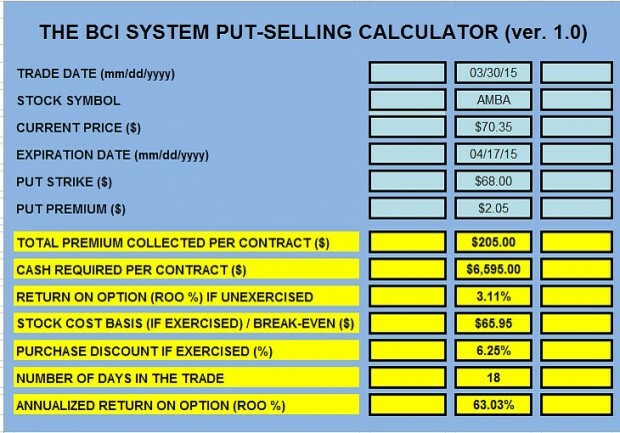 I enjoyed reading your article on using put-selling to substitute for using limit orders. However, I think you may have missed another advantage of the put-selling strategy. In your example, the limit-order investor would not get the desired shares unless the price dipped to $66 whereas the put-selling investor would get them if the price was at $68 on expiration day. And the investor would already be sitting on a profit if the price at expiration was between $65.95 and $68. Perhaps the trade-off here is that the price would only have to dip to $66 for the limit order to work whereas the price would have to be at or below $68 on expiration day in the case of the put selling strategy. At any rate, thanks for sharing! On your Weekly Stock Screening this week has listing the DHI passed all Screens and it has no earning report of this month but in the Yahoo which indicates the Earning report on Apr-21. Will you verify. Please. On our premium Stock reports we break down the eligibility based on contract months NOT calendar months. We are currently in the April contracts which expire on April 17th so DHI would not be eligible for the May contracts until after the report passes. DHI IS eligible for the current April contracts. Please note that on the first page of the “running list” (mid-report) we give the report date and expiration date in the top left corner of that page. 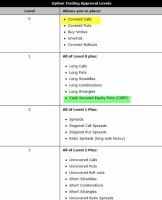 I utilize the Covered Call Investing system so nicely outlined in your books on the subject & have a question regarding the exit strategy involving ITM calls nearing expiration. Most of the time, I want to avoid assignments, so when I have an expiring call & the price of the underlying has increased significantly above the strike price, I buy back the option. This seems especially important if the difference is great enough to make a call attractive. My question, then, is, what is the best time (days) during the last 2 weeks of the one-month cycle to do so without waiting too long & risking an early call? There is no 100% guarantee that early exercise will not occur however it is extremely rare prior to 4 PM ET on expiration Friday unless there is an ex-dividend date prior to expiration. Because of the nature of theta (time value erosion), near-term options are impacted to a greater extent than further out expirations so it pays to wait to as close to expiration as possible. I roll my options between 2 PM and 4 PM ET on expiration Friday. This way you will be paying close to parity (slightly above intrinsic value) to buy back the option. If there is an ex-dividend date prior to expiration and the time value component of the option is less than the dividend, you may want to roll your option 2 days prior to the ex-date or don’t sell the option that month until after the ex-date. ***Tomorrow kicks off the next earnings season which I believe is especially significant because the weekly economic reports have been leaning slightly negatively of late. Corporate earnings is what may determine how nervous the institutional investors become in the near-term in addition to possible FED action in June. Let’s keep a close eye on earnings surprises. In the interim, I am taking a defensive posture and favoring in-the-money strikes 2-to-1. I’m trying to find an ETF that mimics the S&P 500 index? I’m looking for a low cost fund or ETF where I can invest my ROTH IRA accounts. The main S&P 500 ETFs are priced at about $200/share…expensive. These include SPY, IVV and VOO. A 4th RSP, costs about $80 per share but gives equal weight to each stock in the benchmark, rather than base it on size. Another way to play this is to consider the Select Sector SPDRs which are ETFs that divide the S&P 500 into 9 sectors. Then you can purchase the best performers at a lower price per share and also concentrate on the best-performing stocks within the S&P 500 rather than the entire index. We highlight these in our Premium Member ETF Reports. One such report was published about an hour ago so login to the premium site and have a look…pages 3 – 5 of the report. Toll Brothers is the largest luxury home builder in the US with a presence in 19 states. On February 24th, its 1st quarter earnings report came in @ $0.44 compared to a market consensus expectation of $0.30. Revenues were up 33%. Home deliveries were also up 18% year-over-year. With an improving employment picture and mortgage interest rates at all-time lows, the average price per delivered home rose from $693,000 to $782,000. The picture looks favorable moving forward as well as net signed contracts were up 16% from a year ago. Both the company and analysts have raised guidance expecting earnings growth of 15.9% in 2015 and 27.3% in 2016. Our Premium Running List shows TOL in the Building Industry currently ranked “B” with a Scouter rating of 10, a beta of 0.96, weeklys available and adequate open interest for near-the-money strikes.. Check out the chart below to see the beautiful price chart since mid-January (CLICK ON IMAGE TO ENLARGE & USE BACK ARROW TO RETURN TO BLOG). Starbucks split 2-for-1 today…the shares did not go down in value by 50%. Those with positions in SBUX now own twice as many shares at half the price. Those who sold options should adjust strike prices and the number of contracts accordingly. Alan… there is a word of caution for selling puts here with volatility very low. Option prices are primarily determined by Implied Volatility. With vol low, prices for options, especially puts, is low. If the market is hit with a sudden “event” that causes prices to drop quickly, vol will spike. When vol spikes, premiums will also spike meaning an investor can be trapped in a sold put that falls below the strike price, but has higher premiums than when first executed. So one can potentially experience a double loss. It probably will not happen, but it did in the 2008-09 period. An excellent point for option sellers to realize is the impact that market volatility has on our positions. 2008 – 2009 is an outstanding example but also an aberration. When our market assessment is bearish or potentially volatile, I always lean to more defensive investing and will tend to favor ITM calls and deeper OTM puts. I publish my strike balance at the end of all my blog articles. Overall market assessment is critical in our investment decisions and I appreciate your re-iterating this point with our members.